With Winter here, the cold, snow and cabin fever are sure to follow. Finding fun, unique activities for your children to do can be a bit of a challenge. Kids of all ages will love these fun painting activities that won't take a lot of preparation, supplies or money. Edible Paints – Babies are always putting things in their mouths. Whether it's their fingers, toes, a nearby or something you left lying too close, babies are bound to put it into their mouths. While most paints are non-toxic and safe for babies, why not give them something that you know is 100% safe. Pudding makes a great paint. Mix it with water instead of milk (add it slowly until it's to a paint consistency). It will dry like paint does and you won't feel bad when baby puts his or her fingers in their mouth. Other options include baby food (carrots would make a great option), dark jams, or ketchup. Trucks, Trains and Tractors – Anything with wheels will be fun for babies and toddlers to paint with. Tape down some paper, put some paint down and have your little one roll their vehicle around in the paint. Brushes – Why use boring old paint brushes when you could be using scrub brushes, toothbrushes, wide-tooth combs and old hair brushes. Anything with a different texture will make a unique piece of artwork. Depending on the age of the child, you might want to save this one for the outdoors, paint can fly from the brush easily. 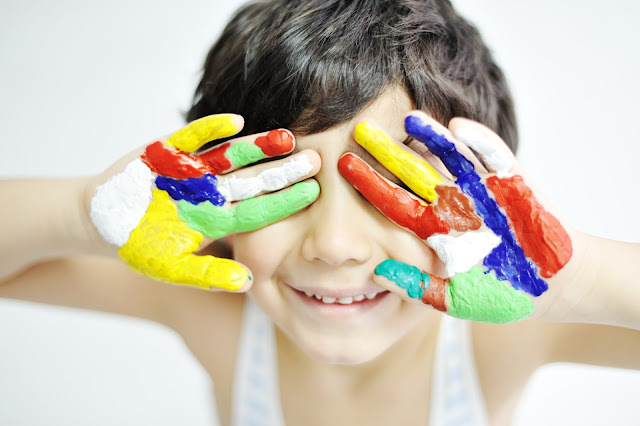 Hand Print/Fingerprint Painting – This is a great activity for kids who have difficulty conceptualizing an image. Use their hands to make shapes. Paint a reindeer by using the foot as the face and hand prints as the antlers. Use a few cut out hand prints, that have been painted yellow to make a sunflower. You can also make a large variety of shapes with fingerprints. Put a small amount of paint on a plate and have your child dip their finger into it before printing on the paper (much like a stamp). The sky is the limit with the paintings you can make using hands, feet and finger prints. Polka Dot Painting – Making art work with polka dots can be lots of fun. To begin the project for smaller kids like preschoolers you can cut out paper in the shape of an animal, a vehicle or any shape you want then have the child add dots of color to it. As they get older, kids can make their own shapes if they choose. Tools to use for making dots can be bingo daubers, pencil erasers, or Q-tips. Drinking Straws – A really fun activity for preschoolers is to make blown art using straws, thinned down paint and some paper. Put a drop of paint on the paper and blow the paint through the straw. This is a great way to make flowers, fireworks or just fun abstract shapes. Kids love this activity. There are so many fun things you can do with paint that doesn't involve a standard paint brush. Anything can become a tool for painting, you just have to think outside the box a bit. 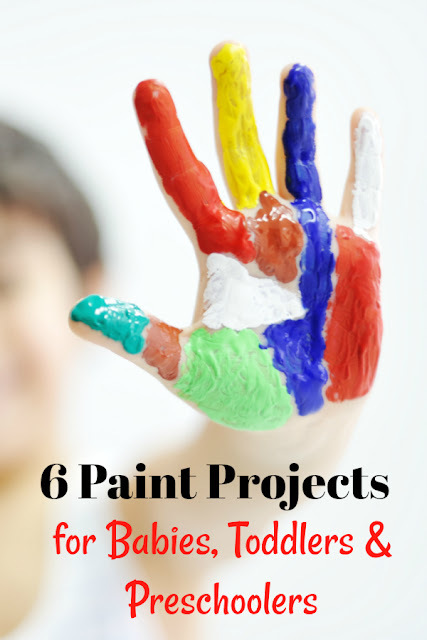 If you want even more painting activities for your kids but have trouble coming up with ideas, check out Pinterest. A quick search will give you many more options to choose from.